What would the compensation be if Canadian nationals, not Nepali guards, had been killed in Kabul? A Taliban suicide attack in Kabul on 20 June killed 13 Nepali and two Indian citizens working as private security guards at the Canadian Embassy. Since then there has been an outpouring of serious concern about the treatment of migrant workers in conflict zones. The debate must be seen in the context of military and security operations — previously the domain of national armed forces — being privatised. The Kabul carnage also revealed Nepal’s dire remittance-dependent economy, and dismal governance. In the last 10 years, the Department of Foreign Employment in Nepal has issued some 9,000 permits for nationals to work in Afghanistan. However, the actual number is said to be much higher, since recruitment is through informal channels and there is no official mechanism to record the number of returnees. In 2006, War on Want produced an influential report that analysed the threats associated with the proliferation of Private Military and Security Companies (PMSCs). Following the declaration of the US-led ‘war on terror’ and subsequent military invasions, private security companies operate throughout the world selling security services to governments, international institutions such as the UN, and private firms. PMSCs provide direct combat, intelligence, training and security services in conflict zones, post-conflict reconstruction and so on. In Iraq and Afghanistan, with a declining presence of the US and allied troops, security services are increasingly outsourced to PMSCs, whose clients include Royal Dutch Shell, BP and ExxonMobil. As an industry that profits from war and political conflicts, PMSCs have come under scrutiny and faced allegations of human rights abuses, absence of accountability, involvement in the illegal weapons trade, and catalysing or exacerbating political conflicts. Even so, contractors are gradually becoming the accepted form of security. After the killing of the Nepali security guards, there has been some debate about outsourcing security and whether the blame should be placed on the Canadian government, the British PMSC Sabre International that employed the guards, or the Nepal government for failing to protect its citizens. Or all three. If we argue that PMSCs should bear the responsibility as they are the direct employers and are also in charge of upholding safety protocols, the question that arises is what mechanism is in place to hold such companies accountable. An International Code of Conduct for Private Security Service Providers (ICoC) was prepared in 2010 in consultation with PMSCs, governments and civil society. However, ICoC is voluntary and based on self-regulation rather than being legally binding. Recruiting vulnerable and desperate employees from poor countries puts PMSCs in a powerful and profitable bargaining position. For instance, there was a case in which Sabre International was receiving $1700 for every Ugandan security guard recruited for the US government, but the security guard's actual pay was no more than $700. Private security guards from developing countries no doubt receive higher salaries than what they would earn at home, but the risks involved are high. By contracting out security at its embassy, the Canadian government protected itself from any financial liability towards the murdered guards. 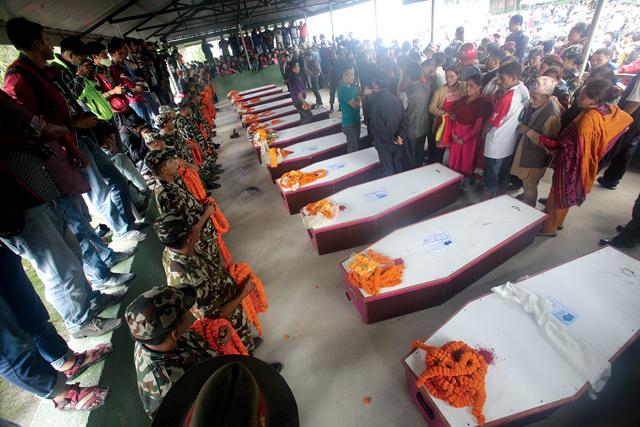 It leads us to the question: what would be the compensation be if those killed had been Canadian nationals, instead of guards from Nepal? Since the public outcry over the loss of national soldiers and the subsequent political cost governments could face are significant, guards from poor countries become easy alternatives, risk minimisers and politically dispensable bodies safeguarding the interests of the rich and powerful. The Nepal government has now imposed a ban on Nepali workers going to Afghanistan. It is doubtful if a blanket ban would work, considering that many migrants in Afghanistan use informal channels to get there and remain largely undocumented. Sabre International, for its part, has committed $30,000 in compensation to each family of the victims of the Kabul attack. The Canadian government condemned the killings and recently held a memorial service for the deceased guards, in the Canadian Embassy in Kabul in the presence of the Indian ambassador. No sign of any representative from Nepal, however. The Canadian government has been tight-lipped about compensation for the victims’ families. This is hypocritical because Canada has exhaustive travel advisories when it comes to the protection of its own public service staff working in places like Afghanistan, who enjoy travel accident insurance, medical evacuation, dependent care and so on worth $500,000. The lesson from the Kabul tragedy could be the urgent need for regulation of the PMSC industry through a framework of legal obligations, with inter-governmental negotiations between countries that are either clients or countries supplying security personnel. The UN Human Rights Council has been developing a binding convention for the regulation of PMSCs, which is a positive step. But PMSCs are economically and politically powerful, and a strong backlash should be expected against any regulation. As for Nepal, the incident is one of the many wake-up calls that relying on remittance without a long-term economic vision is not sustainable. Sangita Thebe Limbu is studying Gender, Development and Globalisation at the London School of Economics and Political Science (LSE). The people of fire gutted village race against time to secure shelter ahead of the monsoon. "Politics is only for the leaders. We never expected anything from the constitution." The unsolved murders of Ranju Jha and her colleagues as well as that of Justice Rana Bahadur Bam will aggravate impunity and weaken the state.